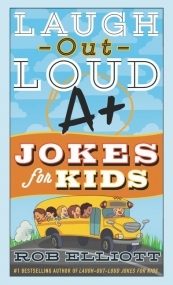 Yet another collection of clean kid’s jokes in the LOL series, this slim paperback offers fresh school-themed humor. As with previous editions, the types of jokes include knock-knock, play on words, and Riddle Puns. There are anywhere from 2-6 jokes per page (117 pages total), with simple grayscale background images of school supplies—all of which are repeated several times. Consistent with previous books from this series, there’s no table of contents—nor any evident organization to the jokes. This remains my primary complaint—as there is no way to look up jokes by topic or easy way to relocate one you’d like to read again. Readers must make special note of the page numbers they’d like to revisit. This book is appropriate for elementary aged children—best suited for those just learning about humor, and those interested in expanding their jest repertoire.